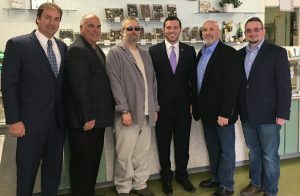 OSWEGO – Mayor Billy Barlow today (March 28) announced a $25,000 grant to Stone’s Homemade Candies, a small business staple in the Oswego community for more than 50 years. Stone’s Candies, owned by Donald Regan, Bill Galloway, Jeff McCrobie and Diego Labaudy (RGML Candies, LLC), will be re-locating to downtown Oswego, renovating the existing building at 23 W. Seneca St.
Stone’s Candies manufactures and sells chocolates, candies, ice cream and other goods and plans to create an on-line shipping operation to serve stores countrywide. The re-location and expansion are expected to create 4 new full-time jobs and 4 new part-time jobs in the next two years in addition to the six existing jobs. Stone’s Candies is scheduled to start renovation construction on its new building in late Spring 2019. The funding comes from the commitment of program income through the NYS Community Development Block Grant program, administered and managed by the city’s Office of Economic Development.